Recently Tons of World of Warcraft users were unable to Login to their account. Each time Users Try to log in; they were greeted with "An error has occurred. Please try again later. (BLZ51903003)" Message. This is very frustrating, and Users took it to Twitter and guys at World of Warcraft jumped in to fix the issue. Although the Blizzard Error Code BLZ51903003 was Fixed few days ago but still, some users are facing this Issue. So we decided to post few troubleshooting methods to get rid of this error. If you are on this page searching for the solution, then you are at right place. When tons of people get the same error at the same time then, most probably its the issue with the servers. In this case, issues with WoW servers. But that doesn't mean we can't do anything to fix issues from our end. 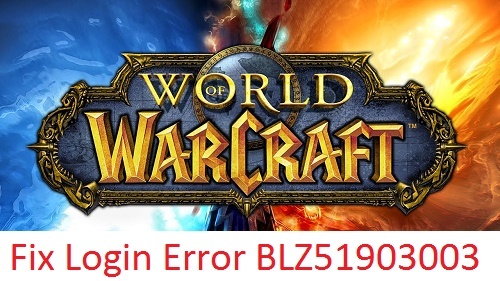 There are couple of methods that we will share below to fix BLZ51903003 error in World of warcraft. There is a workaround too for this. Just read below. Method 1: Flushing Domain Name Server(DNS). In this Method, you will need to flush DNS on your own; it will take a few seconds and after that, you will be able to login to your account seamlessly. This is possible only if there is a problem with your DNS. So lets Quickly see how to Flush DNS using Command prompt. Step 1: Open Command Prompt(CMD) as Admin by Right Clicking on Start button and then clicking on Command Prompt (Admin). Alternatively, you can press Windows + X Keys too. Or Search for "CMD" too. Step 2: Once Command prompt is open, Type "ipconfig /flushdns" and hit Enter. Step 3: That is it, Now close command prompt window and try to Login again. This time, you should be able to log in seamlessly without BLZ51903003 error. Method 2: Creating New account. This is not a permanent solution to the error but it's a great work around. You may try it and see it for yourself whether it works or not. If nothing helps you to fix Error Code BLZ51903003 in World of Warcraft, then you can only wait for the people to fix the code for you. There is nothing much you can do in the case.